2001: Eaton Vance acquires Atlanta Capital Management and Fox Asset Management to help Eaton Vance expand into the retail managed account business. A third major acquisition occurred in mid-2003, when Eaton Vance obtained a majority interest in Parametric Portfolio Associates. 2004: Eaton Vance’s investment counsel business is strengthened by the migration of Scudder Private Investment Counsel, then a unit of Deutsche Bank AG, to the company under the leadership of G. West (“Westy”) Saltonstall. The occasion marked the second of two “firsts:” Eaton Vance’s creation of the mutual fund by a predecessor firm and now the incorporation of the Boston office of Scudder, Stevens & Clark, the firm that created investment counsel in the 1920s. 2007: Thomas E. Faust Jr. becomes CEO and chairman of the company, replacing the retiring Jim Hawkes. 2009: Eaton Vance moves from 255 State Street to Two International Place. 1992: Eaton Vance adopts the “Hub and Spoke” approach to managing many of its funds, experimenting with new ways to develop funds and market them to new customers. 1995: Investors Bank & Trust Company, a highly successful offshoot of Eaton Vance, is spun off as a separate company. 1996: In November 1996, Jim Hawkes is made president and CEO of Eaton Vance, and two years later also becomes chairman. 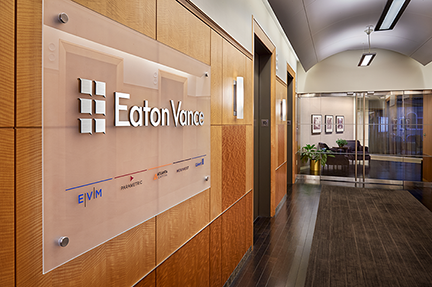 In April, Eaton Vance launches its Tax-Managed Growth Fund, which became very successful, and the start of a continuing focus on tax-managed products “for people who pay taxes.” Eaton Vance moves its stock listing from NASDAQ to the New York Stock Exchange. 1999: Eaton Vance moves from 24 Federal Street to 255 State Street. 1981: Eaton Vance launches Tax-Managed Trust, a tax-efficient mutual fund focused on utility stock investments and using a novel organizational structure. 1984: The Eaton Vance “new products committee” is formed and led by James B. Hawkes. During the years that followed, Hawkes worked closely with Eaton Vance Distributors, Inc. (Duane Waldenberg) and Eaton Vance’s legal department to create dozens of new mutual funds. Late 1980s: Eaton Vance begins to develop its municipal bond offerings. During the first half of the 1990s, Eaton Vance broadly expands the number of offerings of state “muni” funds and adopts three fund payment methods — “Classic,” “Marathon” and “Traditional”—for them. 1989: Eaton Vance launches Prime Rate Reserves, its first bank loan fund. Eaton Vance quickly becomes the industry’s leader and is so successful that sales had to be temporarily suspended in order to provide time for the company to invest the proceeds. 1972: Massachusetts Financial Services, Inc., which manages Massachusetts Investors Trust and other mutual funds, decides to create an internal distribution department and not to renew its sales contract with Vance, Sanders & Company to distribute its funds, ending an almost-50-year relationship. Vance, Sanders & Company moves further into the mutual fund management business. 1978: Vance, Sanders launches Nautilus Fund, a closed-end fund, which invests a portion of its capital in emerging private companies such as Apple Computer and Compaq. April 30, 1979: Eaton Vance is formed by the merger of Eaton & Howard and Vance, Sanders & Company. Landon Clay and Dozier Gardner become chairman and president of the newly merged company. 1961: Vance, Sanders launches its Diversification Fund, the first of a number of exchange funds it created in the 1960s. For the first time, this longtime distributor of mutual funds managed a fund. As share sales declined in the 1970s, management fees from these new funds came to provide much of the company’s income. 1968: Eaton & Howard forms Investors Bank & Trust Company to serve its investment counsel clients and the company's mutual funds. Eaton & Howard hires Boston Red Sox star outfielder Carl Yastrzemski to work with its wholesale operation during the off-season. In a cooperative venture with Massachusetts Investors Trust and two of its former employees, Landon T. Clay and M. Dozier Gardner, Vance, Sanders & Company creates a new mutual fund: the Vance, Sanders Special Fund. 1940-50s: For over two decades, Vance, Sanders sponsors an annual mutual fund conference in Boston as well as sales and training seminars throughout the country for the growing mutual fund industry. 1940: Charles F. Eaton, Jr., and Mahlon E. Traylor, both from Eaton Vance’s predecessor companies, were among the leading individuals to participate and help shape the Investment Company Act of 1940. A year later, Eaton was also instrumental in helping establish the National Association of Investment Companies, renamed the Investment Company Institute (ICI) in 1962. 1944: Vance, Sanders & Company, a partnership, is formed by Henry T. Vance and David T. Sanders. The company’s predecessor companies — Learoyd, Foster & Company, Slayton, Learoyd & Company, and Massachusetts Distributors, Inc. — carry the new partnership back to the creation of the first mutual fund in 1924. 1959: Vance, Sanders & Company becomes a publicly traded company, and also acquires an economic interest in Boston Management & Research, a mutual fund management company. March 29, 1924: The first mutual fund, Massachusetts Investors Trust, is created by Charles H. Learoyd, Hatherly Foster, Jr. and Edward G. Leffler, employees of Learoyd, Foster & Company, a predecessor firm of Vance, Sanders & Company, which ultimately becomes Eaton Vance. December 1, 1924: Charles Freedom Eaton, Jr. and John Glenny Howard form Eaton & Howard. 1929: Eaton & Howard begins to create mutual funds for their customers. By 1929, the firm had four different funds — the Accumulation Fund and Management Fund A, B and C.
1929: Eaton & Howard organizes an investment research department, one of the earliest in the industry, and hires investment analyst Barbara Dailey (Jewell), an economics graduate of Wellesley College and the first woman professional in the company. 1937: Eaton & Howard moves from 1 Federal Street, Boston, to 24 Federal Street. The building’s iconic doors have served as a logo for the company in many different forms through the years. December 2, 2014: Eaton Vance receives approval from the SEC to offer exchange-traded managed funds (ETMFs), the first actively managed exchange-traded products that do not require full-transparency of portfolio holdings and trading activity. December 31, 2012: Parametric Portfolio Associates acquires The Clifton Group, which provides futures and options-based overlay services and custom risk management solutions to institutional investors. June 18, 2012: Eaton Vance acquires a 49% interest in Hexavest, a Canadian manager of global equity and tactical asset allocation strategies.